A Science Girl at Sea! Education Officer Training at Texas A&M! I just returned from the Education Officer training in Texas where I met so many wonderful, intelligent, and geniunely kind people. It’s refreshing to be introduced to individuals who share the same passion as you, and moreover, who are inclusive and want to help answer any and every possible thought that pops into your head. I was slightly nervous (I mean, let’s be honest – spending 2 months on a boat with a bunch of scientists is intimidating, especially if you’re a somewhat private person) but when Leslie (one of the Directors of this shabang) made a comment like “I’m as good a sedimentologist as any paleomagnetist!” was the moment I knew I was in the right place with the right people. By the end of the training, I think all of our heads were a little sore. Not because the information was complicated, but because there was just a lot to sift through. And I have to say Sharon and Leslie and everyone they introduced us to did an incredible job of relieving all of our collective anxiety. We (the other Education Officers for the upcoming year and myself) got a tour of the core repository, which I think may have been the highlight for me. Seeing the rows and rows of cores in these “refers” (short for refridgerators) was inspiring. 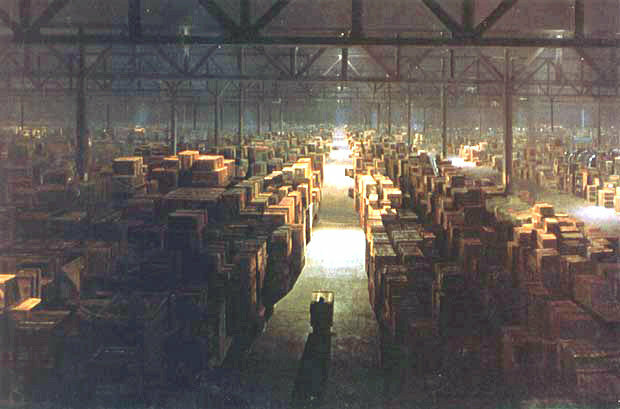 Although, stepping into the first one and getting a glance at all of the stacks reminded me a little of the warehouse scene in Indiana Jones. Guy-with-Pipe: We have top men working on it right now. Guy with Pipe: Top. Men. My biggest concern, I think, will be finding the balance between completing the objectives of the Education Officer, and having time to do all of the art projects I want to complete (and more accurately…all of the ones that pop up unexpectedly when a surge of inspiration hits). I went into this training with a clear head and really wanting to absorb as much as possible, and throw myself into these tasks I have to accomplish. I forgot though, the artist in me is strong, and is not going to sit back and stay quiet. But, I think that’s a good thing. Why fight it? My goal as an Education Officer on this expedition is to not block that artist/scientist connection, but rather to exploit it. I plan to post a ton of hands-on turtorials and homemade science experiements you guys can do on shore, and that I can do on the boat as well. Everything I do will be posted here – even the art projects – and will include the science behind whatever handmade gizmo is produced. A lot of it you may not want to try, but most of it you hopefully will. In any event, I intend to give you information overload and more importantly, give you a place you can return to and reboot with some notes and sketches.